The global climate summit in Paris agreed a landmark accord on Saturday, setting the course for a "historic" transformation of the world's fossil fuel-driven economy within decades in a bid to arrest global warming. The deal comes at the tail end of the hottest year on record and after four years of fraught U.N. talks often pitting the interests of rich nations against poor, and imperilled island states against rising economic powerhouses. French Foreign Minister Laurent Fabius took just minutes to declare the pact adopted to the standing applause and whistles of delegates from almost 200 nations. "With a small hammer you can achieve great things," Fabius said as he gavelled the agreement, surprising many observers who were bracing for several hours of discussion following the two weeks of difficult negotiations. Hailed as the first truly global climate deal, committing both rich and poor nations to reining in rising emissions blamed for warming the planet, it sets out a sweeping long-term goal of eliminating net man-made greenhouse gas output this century. It also creates a system to encourage nations to step up voluntary domestic efforts to curb emissions, and provides billions more dollars to help poor nations cope with the transition to a greener economy. Calling it "ambitious and balanced", Fabius said the accord would mark a "historic turning point" in efforts to avert the potentially disastrous consequences of an overheated planet. US President Barack Obama, for whom a deal in Paris is a legacy-defining achievement, said it was "huge". "Almost every country in the world just signed on to the Paris Agreement on climate change - thanks to American leadership," he said via Twitter. The final agreement was essentially unchanged from a draft unveiled earlier in the day, including a more ambitious objective of restraining the rise in temperatures to "well below" 2 degrees Celsius above pre-industrial levels, a mark scientists fear could be a tipping point for the climate. Previously, the goal on temperature rise was set at 2 degrees Celsius in 2010. "This is a win for humanity," said Brazil Minister Environment Izabella Teixeira. In some ways its success was assured before the summit began: 187 nations have submitted detailed national plans for how they will contain the rise in greenhouse gas emissions, commitments that are the core of the Paris deal. While leaving each country to pursue those measures on its own, the agreement finally sets a common vision and course of action after years of bickering over how to move forward. Officials hope a unified stance will be a powerful symbol for world citizens and a potent signal to the executives and investors they're counting on to spend trillions of dollars to replace coal-fired power with solar panels and windmills. While some climate change activists and US Republicans will likely find fault with the accord - either for failing to take sufficiently drastic action, or for overreacting to an uncertain threat - many of the estimated 30,000 officials, academics and campaigners who set up camp on the outskirts of Paris say they see it as a long overdue turning point. 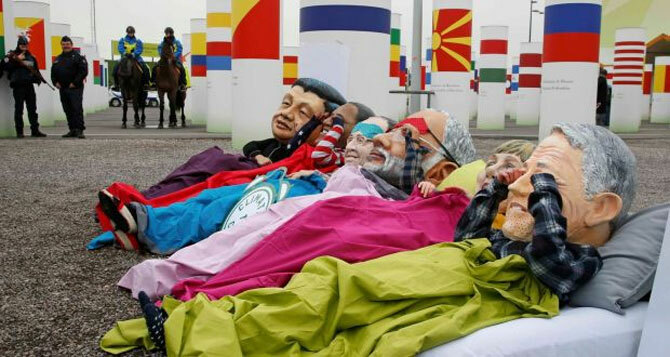 Six years after the previous climate summit in Copenhagen ended in failure and acrimony, the Paris pact appears to have rebuilt much of the trust required for a concerted global effort to combat climate change, delegates say. "Whereas we left Copenhagen scared of what comes next, we'll leave Paris inspired to keep fighting," said David Turnbull, Director at Oil Change International, a research and advocacy organisation opposed to fossil fuel production. Most climate activists reacted positively, encouraged by long-term targets that were more ambitious than they expected, while warning it was only the first step of many. From the outset, some have criticized the deal for setting too low a bar for success. Scientists warn that the envisaged national emissions cuts will not be enough to keep warming to less than 2 degrees Celsius (3.6 Fahrenheit). Unlike the Kyoto Protocol, the last major climate deal agreed in 1997, the Paris pact will also not be a fully legally binding treaty, something that would almost certainly fail to pass the US Congress. In the United States, many Republicans will see the pact as a dangerous endeavour that threatens to trade economic prosperity for an uncertain if greener future.